Our Cross with Sugar Flower is one of our most popular crosses. Use the Pop Fill Option to choose the color of the Cross. Use Accent # 1 to choose the color for the Sugar Flower. 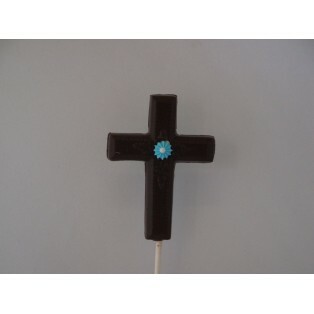 Shown in picture Pop Fill is Dark Chocolate and Accent #1 is Blue Sugar Flower.